The BLU-49 was a ring-tailed anti-personnel fragmentation bomblet. While waiting for answers to our questions and comments about the closure of the Open Burn / Open Detonation (OB/OP) cleanup plan at Aerojet Chino Hills, as addressed in our July 20 “Blow In Place” post, we came across a new set of documents on the Department of Toxic Substances Control’s Envirostor website under DTSC’s Community Involvement page. There we found a 76-page report called “DRAFT INVESTIGATION REPORT – MUNITIONS AND EXPLOSIVES OF CONCERN – DATA GAP INVESTIGATION” created in July 2009 by Huntsville, Alabama-based Weston Solutions, Inc.
From all indications, Aerojet and Weston have done a good job finding 52 “munitions and explosives of concern” across a 39-acre area of the 800-acre facility, along with 70 pounds of munitions debris. The company used blind “seeding” of planted objects as a quality control measure and all of the seeded objects were found. Regardless of our concerns with the OB/OP cleanup plan, this Weston-created report seems to have all its bases covered. Indeed, this was literally a “bombs away” operation at Aerojet Chino Hills. Photos of the company’s operations are available in Appendix E and worth a look. Weston Solutions Inc. and Aerojet-General Corporation (Aerojet) completed the planned munitions and explosives of concern (MEC) detection and removal activities at Aerojet’s Chino Hills Facility and the surrounding study area within areas that were not previously investigated for MEC (data gap investigation). Digital and analog handheld geophysical instrumentation were used to detect MEC to instrument detection depth within accessible areas of each data gap and within areas that did not contain cultural features which may potentially mask MEC. A total of 39 accessible acres were included in the MEC data gap investigation, including approximately 8.7-acres of digital geophysical mapping coverage and approximately 30.2-acres of mag & dig surveys. A total of 55 items characterized as material potentially presenting an explosive hazard (MPPEH) were recovered during the investigation. MPPEH were recovered within Area 16, South of Area 16, Bonnett, and Lee #4. Fifty-two (52) of the MPPEH items were recovered in Area 16 and South of Area 16 as anticipated based on the site’s conceptual site model. In addition, approximately 70 pounds of munitions debris were recovered during the MEC data gap investigation. No MPPEH were observed within 200-ft of the open burn/open detonation kick out radius and an adaptive clearance was not warranted. There were several levels of quality assurance and quality control put in place. They included a physics-based test strip approach, a robust site-wide seeding program, establishing individual quality control measurement criteria, and a re-collection program. There were no quality control failures, signifying all detection systems were found to perform in accordance with the California Environmental Protection Agency, Department of Toxic Substances approved project Work Plan. Project data quality objectives of detecting MEC to instrument detection depth were achieved. Weston Solutions, Inc. (WESTON®) assisted Aerojet with this work between 5 January and 13 February 2009. This project was conducted in consultation with the California Environmental Protection Agency (EPA), Department of Toxic Substances Control (DTSC) as part of corrective action pursuant to the 1994 Agreement on Consent. The primary objective of this project was to detect and remove MEC within accessible data gap areas. Data gaps included in the technical scope of this project include areas not previously investigated for MEC, that were accessible to geophysical instrumentation and did not contain cultural features which may mask MEC (such as asphalt/concrete surfaces, buildings/structures and piping). Before 1954, the study area was undeveloped and used for grazing cattle. Operations began in 1954 and included limited testing of ordnance, and research activities. In the 1960s, Aerojet began loading, assembling, and packing operations for several government munitions systems under contracts with the United States Department of Defense (DOD). During the 1970s, operations expanded and primarily involved testing explosives and propellants. After 1974, operations primarily involved research, development, and testing of high-explosive incendiary (HEI) projectiles, armor piercing incendiary (API) projectiles composed in part of depleted uranium (DU), target practice (TPs) rounds, and fuzes. These activities were conducted in specific and limited areas within the study area which are referred to as the “operational areas.” Aerojet ceased operations at the facility in November 1995. Various MD and related components. Site survey and removal grid layout operations began in December 2008 immediately following the full containment of wildfires which struck the Aerojet Facility and surrounding areas. The wildfires removed vegetation, allowing further accessibility to the survey crew and for subsequent MEC investigations. 1. In what way was it clandestine? Aerojet, just as any other business, had to file permits, etc., before allowing any item to go from drawing board to practical test on that site. Its existence was not hidden from the public. The large fence around the area and guards (unarmed, btw) at the gate do not make it clandestine. Such are for safety obvious reasons, as well as security — industrial espionage occurs in the ordnance-making business just as it does in fashion, electronic and other industries. Yes, those two thieves stole from Aerojet. I helped with the increased security afterward. I was addressing (in part) the one where an item was found “in a ditch” that turned out to me an old-fashioned fragmentation grenade “with the pin out”. 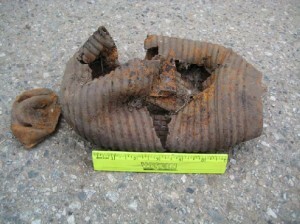 That type of grenade had never been manufactured or tested at that site. (BTW, the “grenade” type that was stolen was not a hand grenade but a 40mm meant to be fired from a barrel — it has no pin. What’s more, it was a PRACTICE round, not loaded in a cartridge. It was made of solid aluminum, no fuzing, no explosives. You would have to throw it at someone, hard, to get seriously hurt by it. In fact, none of the items stolen were explosively hazardous — something the Sheriff’s Department either didn’t know, or didn’t bother to pass along. 2. As to the the ground contaminants, here is how it was put to me (by two independant and reliable sources): Person A compiles a list of ALL potential contaminants of all manufacturing, distributing, and/or testing plants and facilities in southern California. That individual then turns the list over to Person B. Person B then turns the list over to Person C, misrepresenting it (for reasons unknown) as a list of contaminants recently found at Aerojet, Person C runs with the lie (probably unsuspectingly) and the so-called “truth is exposed”. (The geologist who made a study of that hill, btw, determined that the water table slants away from Chino Hills and its water supply, toward the backside of the hill, a considerable distance away. So, even if those contaminants had been somehow released at Aerojet (which I don’t believe they were) they would not have ended up where they were reported to be. 3. I’m not familiar with the DTSC’s issues before the shut-down, but I do know they were all over the site, and were fully aware of all our cleanup operations and methods. For what it’s worth, I practically lived on that site for seven years, walking, driving, operating various types of equipment, digging holes, and never once did I see a “mutated animal”. There were squirrels, rabbits, skunks, wild turkeys, quail and other birds, and coyotes. On neighboring properties, there were cows. And every single one of them appeared to have the standard number of eyes, limbs, and other animal features. Plantlife grew hale and hearty. Again, for what it’s worth. @Dog: Thank you for these detailed comments. Yes, the facility was clandestine but you are correct when you note Chino Hills grew up around the site. The ordnance found by the kids who broke into Aerojet has been confirmed by multiple sources, including the police, and includes details down to the building broken into where the bomblets were found. Aerojet increased security after the break in. The chemicals and contaminants found in the water do match what was used at the site. As we reported, cleanup at Aerojet Chino Hills began before our expose. The additional work that resulted in the photos on our site came after our expose and more than one official credited the work for the increased remediation. Of course all the OB/OD work was legal. While Aerojet followed the cleanup process, what is clear is that the California EPA’s Department of Toxic Substances Control did not. DTSC dropped the ball much like it has at numerous other sites around the state giving the department the unfortunate reputation as being a ‘captured agency’ beholden to polluters. In an investigative series beginning next week about another site, we will show that DTSC is just that and more much to its discredit. Also, no investigation by anyone from the media prompted the cleanup at Aerojet. Once that particular facility was closed, the company sought bids for its remediation. I began work there in 1996 (with one of the subcontractors), but the company I worked for had already been conducting various cleanup operations for nearly a year, and well before that a company (now called Weston, I believe) began work in the OB/OD area. All legal. All aboveboard. Myself, I won’t claim Aerojet is some sort of saintly entity (I never actually worked for them — I was in on the stuff that came after close-down), but I do know there is a certain process a company goes through, certain protocols that are followed, in order to make safe a facility that did this kind of work. Nowhere can I see that Aerojet did anything but follow that process. Cleanups on such sites are common. There’s nothing secret about them. It is simply what you do when R&D facilities close, or when military bases close, etc. Also, one report described Aerojet as being “clandestine”. No. It was functioning (and said operation was public knowledge, its work was kept from no one) long before the city grew around it. (In other words, Chino Hills snuck up on Aerojet, Aerojet did not sneak up on Chino Hills.) Also, the ordnance items “found” by locals down the hill did not come from Aerojet — those particular items were never manufactured nor tested there. (Likely, they were souvenirs owned by dads or grandfathers.) More, the chemicals and contaminates supposedly found in waters supplies also did not match with what was used on the site. There’s lots more. (That BLU-49 bomblet in that photo? it was empty. It had never been filled was explosives. The damage to it was simply to open it up so, in the future, it could be seen to be empty. BTW, I was there when the photo was taken. In fact, I took some of the pictures shown in these reports.) Well, time is money…perhaps I’ll tell you more later. 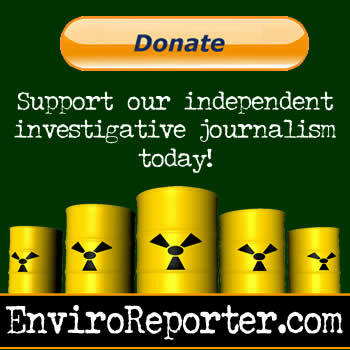 @Dog: The reason you were even on the cleanup from 2000 on might have something to do with the $46 million and counting spent to clean up the place as a result of our investigative series in two newspapers and now more ably reported in new media on EnviroReporter.com. That is if you, an anonymous commenter, did actually work there which I will assume you did. That you would characterize the findings we uncovered in this fashion suggests that you might be one of the reasons the cleanup of the place is incomplete. Our readers would certainly be interested in anything you might wish to share with us further. I was in on the Aerojet cleanup from 1996 to 2003. Nearly every report on this site and its remediation operations (and the operations preceeding them) that I have read have been misleading, inaccurate, and just downright bull****. It is amusing what some people think the Aerojet facility was (a miniature Area 51? Really? ), but it is not amusing to see the news media fanning the flames of paranoia. Interesting article/study!! I live in Chino Hills (however a ways from the AeroJet grounds) and the past few years I’ve become interested in learning more about the history of the facility. Your studies are without a doubt some of the best, most detailed I could find!